This fabulous building on High Street in the north of Lowestoft was constructed at a time which was probably the highest point in post-war church architecture. Opened in 1970, it reflects a community that is full of confidence about its faith and its place in its local community. It is hard to imagine such a brave building going up anywhere in England today, especially not a Methodist church. From the road, you are first struck by the spare, clean lines of the entrance portico, the idea of an East Anglian porch refracted and transformed through the language of the early post-modern. The architect was Wally Thompson, who was a member of the congregation here, and also the designer of the seaside-merry St Andrew Methodist at Sheringham in Norfolk, with which the interior of this church has much in common. 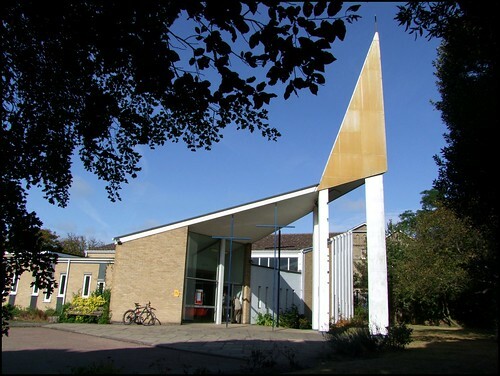 The Sheringham church was built in 1968, and still harks back to the Festival of Britain motifs of the previous decade, although it does look forward to the church-in-the-round liturgical spaces which the Second Vatican Council was inspiring in churches of all denominations. That liturgical imperative is brough to fruition here. You step sideways through the portico into a great off-centre bowl, with the lectern and holy table equidistant from each length of curving row. Modern hangings and weavings decorate the plain brickwork and plaster, and despite the jaunty coloured glass in the narrow slit-windows, this space feels full of light. It is used regularly for concerts and civic events. The new church was built to accomodate the congregations of three north Lowestoft Methodist churches which were closing. All of them have since been demolished, although the one in the High Street has been replaced by an office building called Wesley House. In an age when Methodism as a movement is tending to fade from public view, the Trinity congregation retain their place as one of the most prominent in this fascinating town. As the lady at Kirkley Anglican Parish church said to me, "I'm afraid that the Methodists rather rule the roost in Lowestoft". And what a terrific roost it is!